The Master Users Group is geared toward today's telecom service providers, tower companies, and wireless professionals. Focus is on Anritsu’s RF Handheld instruments. The in-site newsletter is sent out quarterly. Topics include trends, solutions, news, training, and product update information. Email notifications are sent out after a new version of firmware becomes available. These updates include bug fixes, as well as new options that work with your instrument. Be sure and sign up for these periodic updates. 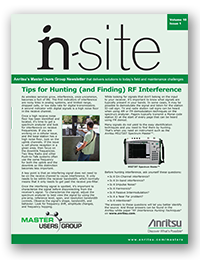 Anritsu offers a series of informative blogs written by well-respected industry leaders who share their experiences and discuss trends in wireless communications. Base Station Transmits focuses on antenna systems, backhaul testing, interference, and meeting key performance indicators (KPIs). Interference Hunting provides readers with cost- and time-efficient processes to determine if interference is causing a problem, locate its sources, as well as offer practical tips on measuring interference to optimize wireless network performance. Solid Signals focuses on trends and news in land mobile and specialized mobile radio technology, LMR spectrum policy, public safety, and commercial radio technologies. The PIM Source discusses challenges in locating and testing Passive Intermodulation (PIM) in the field, fundamentals of PIM measurements, and methods of preventing and/or eliminating PIM in cellular networks. VNA Reflections discusses leading trends in vector network analysis, emerging VNA applications, fundamentals of VNA measurements, and technological advances in VNAs.